Pseudo Tai Tai: an Australian in Hong Kong: Activity for future overseas guests? I had a little giggle when I read The Standard (Hong Kong's free daily English speaking newspaper) last week. 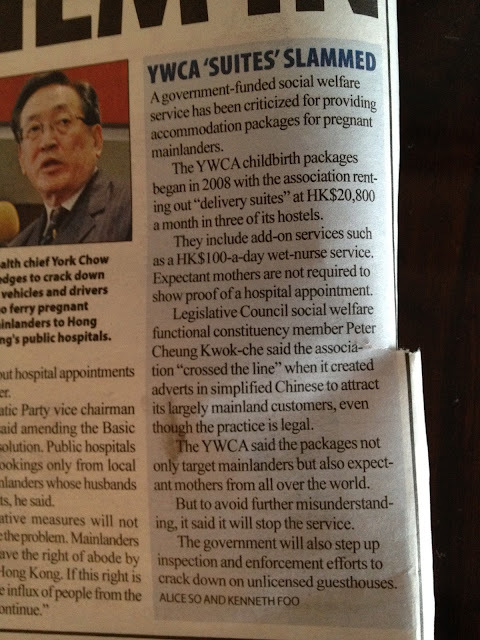 Up until recently and unbeknownst to the average holiday maker, you could go to Hong Kong's YWCA hotels and take advantage of their 'birth packages'. You could even get add-on services such as a HK$100 a day wet nurse (currently a little over $10 Australian dollars). The hilarious part is that we at PTT's Hong Kong Headquarters always farm out our overseas guests to the YWCA hotels as we live in a postage stamp sized abode and the YWCA Hotels are in excellent locations, clean and very well priced for Hong Kong.